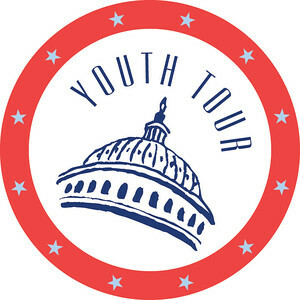 The Rural Electric Youth Tour brings more than 1,300 high school students to Washington, DC, every year, since the early 1960s. To date, 40,000 students from rural areas and small towns all over America have participated in this unique program. Students on the tour learn about electric cooperatives, American history and U.S. government. They attend educational seminars, visit with their representatives in the House and the Senate, and see the sights around Washington, DC. Students are selected for this program by their local electric cooperative through the overall strength of the applicant. If you want to join this Washington tradition, contact your local rural electric cooperative or high school career center for additional information. Students compete for the opportunity to participate by submitting an essay. If you would like more information on the Tour, you can visit the NRECA’s website. Be a sophomore, junior, or senior in good standing with your school. Be 16 years of age by June 1, 2019. Parent(s) or guardian(s) have to be Hart EMC full-time residential members. To apply for this once-in-a-lifetime opportunity, please complete the 2019 Washington Youth Tour Application and submit it by February 8, 2019. Interested students who would like to sign up, should contact our Member Service Department or send an email to angie.brown@hartemc.com.